1. To avoid distraction and unfinished jobs focus your attention on one room at a time. The satisfaction you get from completing one room will encourage you to complete the rest of the house. 2. Always dust before any floor cleaning or vacuuming. Don’t forget ceilings, skirting boards, wall corners and any other intricate areas you may tend to ignore during a regular clean. 3. Multi-task. While you scrub the bath tub, do the dishes, or catch up on laundry. Increase productivity wherever you can. 4. 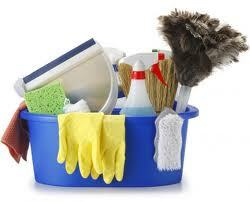 De-clutter the whole house by doing a ‘drive-by’ sweep of every room. Collect anything that you no longer need, want or use from each room and dump it in one particular place so that you know what’s no longer needed. Separate into organised piles, including charity store, recycling or eBay for example. Keeping things as de-cluttered as possible will allow you to maintain your cleaning in the long-run. 5. Steam clean the carpets. Carpets especially accumulate dust over the winter and often cannot be shifted using a regular vacuum cleaner so require an industrial clean to breathe new life into them. 6. Make your windows sparkle again by cleaning marks and smears. For an easy homemade recipe take one part vinegar and one part water and scrub using newspaper. A simple and effective way to make those windows shine again. 7. Deep clean the oven. Apply a generous amount of bicarbonate of soda to the inside of your oven and leave to soak overnight. In the morning take a sponge and simply wipe off the remaining debris. 8. Go through the pantry and food cupboards to dispose of any food items that have passed their sell-by out. It’s always surprising how many there are still lurking. 9. Machine wash your curtains, or have them professionally dry-cleaned. This is often an underestimated tip as fresh curtains really help brighten up any room. 10. Buff any wood furniture. Beeswax is a great natural cleaner and restores shine to wood furniture, especially pine so it’s always worth the extra effort to improve the look of your furniture.